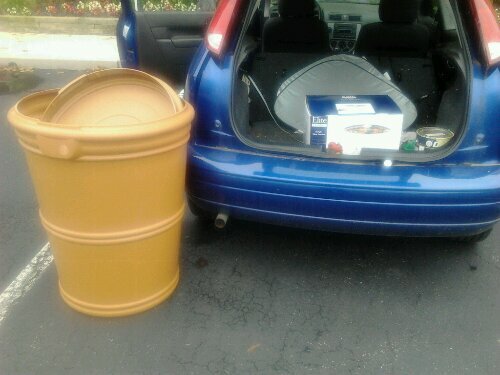 Yay I finally picked up my $40 rainbarrel from the city of Columbus. You may find my timing ironic because it has been raining for days and now that its done I finally got my rainwater collection system but whatever. As part of its effort to reduce sewage issues, you can get a system from the city at cost that let’s youdivert rainwater from the sewers into your garden. Yay! And it fits in my focus. Is that box in the back one of your 12 slow cookers? yes! Sharp eyes! It can’t be returned, alas. But I feel powerful in my ability to cook gallons of beans at a time.